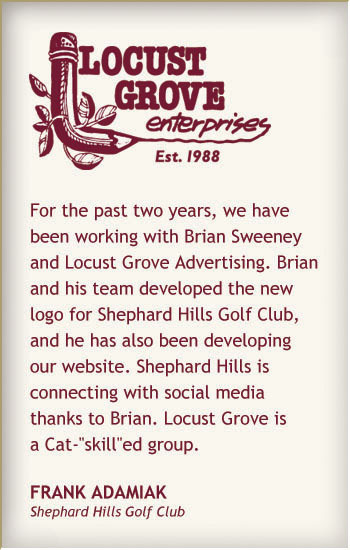 LOCUST GROVE ENTERPRISES was founded in 1988 to provide advertising and marketing services. We’ve done that very successfully for a wide variety of clients. From smaller jobs, such as producing business cards and letterhead, to developing large-scale travel guides and intricate websites, Locust Grove delivers top-quality work. On the marketing end of the business, Locust Grove is uniquely positioned to assist clients. An extensive knowledge of the Catskill Region and significant “downstate” contacts make it possible for us to promote your business both locally or on an expanded scale — depending on your needs. Locust Grove has produced marketing campaigns for many successful ventures including the year-round activities at Frost Valley YMCA (one of the country’s largest “Y” facilities), the Belleayre Music Festival in Highmount (one of the area’s premier music venues), the Pakatakan Farmers’ Market in Halcottsville (a very popular seasonal market offering regional goods) and the two original Tastes and Sounds of the Catskills festivals (the model for the current Margaretville Cauliflower Festival). Our company also helped the Catskill Recreation Center in Arkville exceed its goals and grow to more than 700 active members in its first six months of operation after opening in 2014. Please give us a call today and learn more about how Locust Grove Enterprises can provide services to benefit your business. or e-mail to arrange for a free consultation.